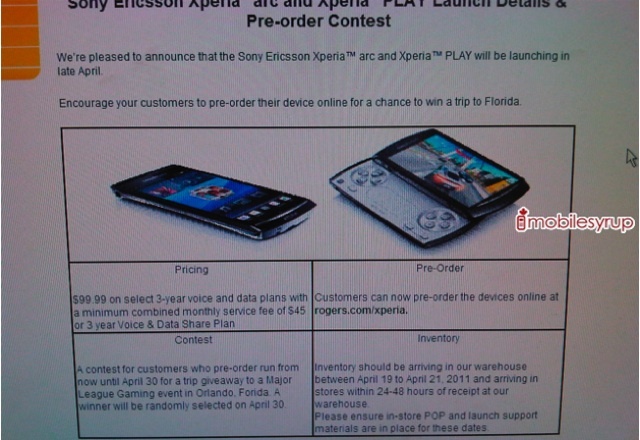 These upcoming launches of the Sony Ericsson Xperia Play and arc are more than anticipated. We can now confirm these two stellar Android-powered devices will be launching “late April” with inventory shipping to Rogers stores between April 19th – 21st. As for prices, taking a look at the screenshot shows you can expect to see both of these available for $99.99 on a 3-year contract (with a minimum $45 Voice and Data plan). No word yet on the no-contract prices. All good news, we’re ready to play. Sony’s SmartBand wants to be your life device, but is it enough?